So there I stood in the brush , stunned, looking up at the trail only 10 feet away. How was I going to get my bike over the fallen logs and back up the hill on to the trail ? I was lucky enough to have another rider with me and together we were able to wrestle my bike back to firm ground. That day I was riding a dual sport motorcycle that weighed less than 300lbs, but had I been riding my adventure motorcycle weighing in over 500lbs, those ten feet would have been the same as a mile. On a large bike , even being a short distance off a trail or road, or being stuck in sand or mud , c an be critical if you cannot self-recover the bike. That day I started looking for a way to recover a bike if I did the same thing again (more like 'when' give my passion for challenging treks). A friend of mine ran a kayaking business for many years , and after explaining my scenarios and what I was searching for he introduced me to a recovery method that is used to recover kayaks when they sink or get stuck against rocks in swift water. When these lightweight boats fill with water they can weigh more than a loaded BMW GS. I took the "z-drag" recovery method , did some research, and located cord, pulleys, knots and techniques that would work optimally for recovery a motorcycle. Using this recovery method reduces the bike to 1/3 of its weight and can be operated solo or with a partner. If you are riding with a partner or two there is an added technique called a vector pull that will reduce recovery weight to even less than that! Although as I explain how to use this system I will be referring to pulling a bike up a hill, it can also be used to move other equipment, right a motorcycle that has fallen over , or even lower a bike down an embankment to o steep to ride . 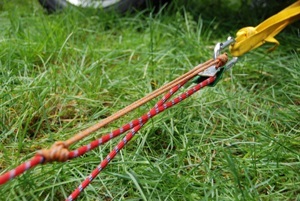 Begin by taking a 1" wide webbing strap and securing it to an anchor point , such as a boulder or tree. Other anchoring methods include using rope and anchoring spikes, using a buried log or even another motorcycle positioned correctly, but here in the Pacific Northwest trees are often nearby . 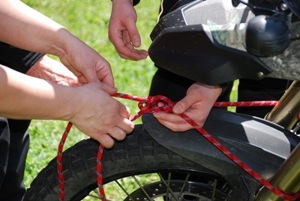 Next, use a figure-eight knot or bowline knot to secure the load bearing rope to the bike frame, crash bar or forks . Once you have tied off the bike , take the loose end up to the anchor location and lay it into a rescue grade split pulley and attach the pulley to the webbing strap with a carabineer. 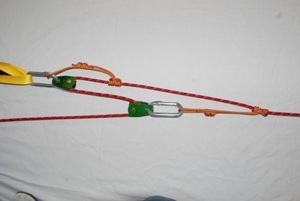 For safety, create a line brake by using a prusik loop to tie a friction hitch knot (very common for mountain climbers) known as a prusik knot onto the rope coming from the bike before the pulley. Attach the prusik into the same carabineer used to attach the pulley to the webbing strap. This brake will allow you to pull the bike up the hill but it will not let the bike slide back down the when the line is released. This is a very important safety measure in case you lose footing. It also provides the opportunity to take a break when needed or adjust the setup . Without this brake the bike would slide back down the hill as soon as the line is released and the load would become a hazard as well as make it difficult to work the bike up the hill. Take a second prusik loop and tie a prusik knot down the line before the first prusik. Lay the loose end of the rope into a second pulley and then attach it onto the prusik with a carabineer and the system is ready to use. Anchor point on left. Item to recover on right. Your lines will be spaced out further than the picture, but this is how the whole system will look once it is rigged. The system can also be reversed, depending on whether you are solo and the direction of recovery. 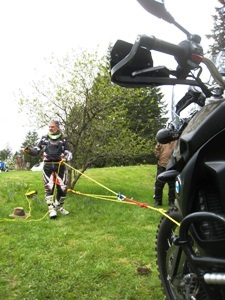 As the bike moves closer to the anchor point , the working distance between the bike and the prusik securing the pulley to the load rope will shorten up . W I simply slide the prusik and pulley down the line. The neat thing about using a prusik knot is that it locks onto the line when the prusik is loaded (you release the load on the line and the prusik loop stretches). Remove the load from the prusik and it can be slid up or down the line. If you are serious about adventure riding or dual	sporting and plan to ride on trails, gravel roads	or in any remote area , it is critical to be as self sufficient as possible. Having a system like this is a no - brainer and should be added as a critical part of your packing list. To me it is as important as grabbing a first aid kit or my tools . I hope the prospect of self recovery sounds as important to you as is does to me. 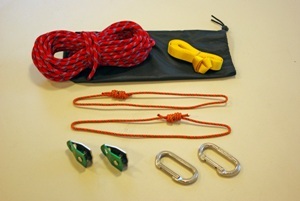 If you are building your own rope recovery kit, i t is critically important to use only the highest grade cord, pulleys and carabineers. The cord and pulleys I use are rated for thousands of pounds because of the shock-weight factor should the bike suddenly fall downhill. Local hardware stores do sell rope and webbing but they are typically rated for only a couple hundred pounds. Quality cord, webbing and pulleys do cost a bit more, but are well worth the investment. Building your own kit is fairly simple. 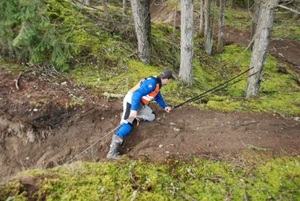 The contents list for the PSS Off Road Motorcycle Recovery System that I have includes 10ft of webbing, 60ft of high strength cord, pre-tied prusik loops, 2 carabineers, 2 prusik-minding split pulleys, a crib card describing knots and system assembly, as well as detailed directions and a bag to store it all. If you ride in an area short of anchor points you may want to add more cord, ground anchors, or a shovel for making a dead man anchor. If you prefer to just pick up a ready -made kit there are a few places you can find them. The PSS Off Road K it can be found in the $160 range and is optimized for motorcycle use. Another well known source for a z-drag kit is NRS, however , their kits are optimized for kayaking use and are a bit bulkier and priced around $270. Northwest River Supplies � nrsweb.com , search "Z-Drag Kit"
Besides the occasion al use when I get stuck in mud, or mid-way on a steep slippery hill, I have also used m y Motorcycle Recovery System to build extra shelter at camp and to hoist my food up a tree to keep away from bears and other critters when out in the woods.